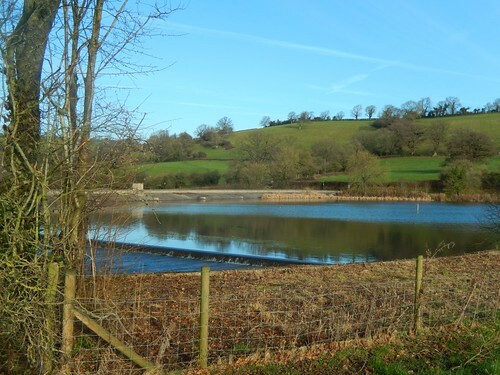 Boxing Day and this walk is set only a few miles south of Chew Valley Lake but on land that seems to be largely unknown to the masses. 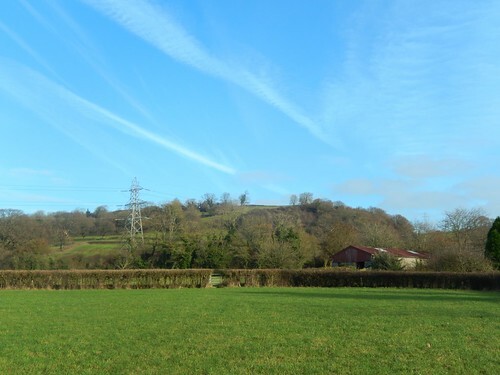 It begins in Hinton Blewett and you can find the route I followed on the Mendip Hills website. 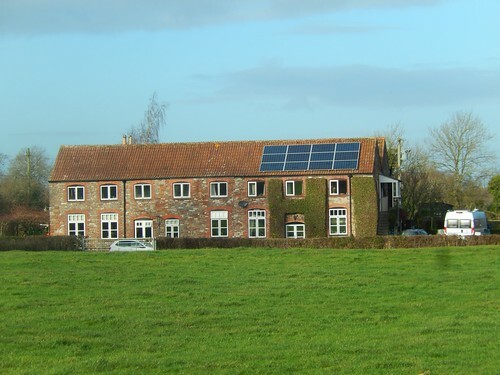 For such a small village, it’s pleasantly surprising to find a small but convenient car park located opposite the Ring O’ Bells pub – which, in itself, should not be mistaken for another pub at nearby Compton Martin, where Coldplay featured for a surprise gig, a few Christmases ago. Finding my first steps along this route was easy and without obstruction. 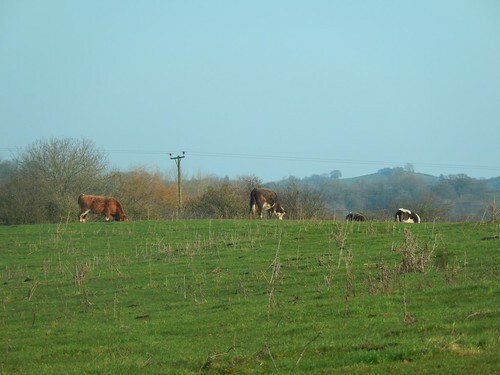 But from the first proper field above Coley Hill, there were cows awaiting. Being late December, I again questioned why they hadn’t already been sheltered away for the winter. From here, the descent was gradual and the path, well directed and easy to follow. 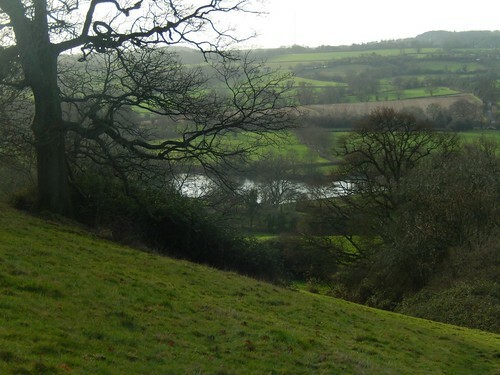 I think you can see Butcombe and/or Nempnett Thrubwell, in the photo above. Descending more steeply through the next field, I could see Sherborne’s [Somerset, not Dorset] Lower Reservoir through the bare branches. 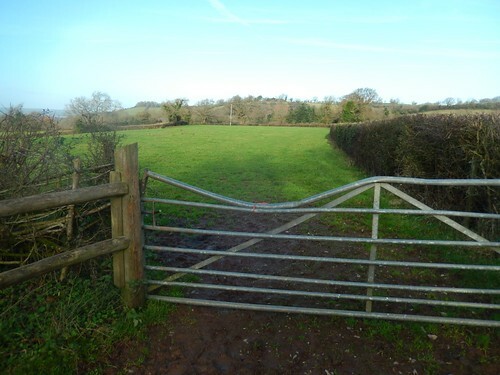 But the way ahead was harder to find and I lost a good number of minutes wandering around the wrong fields (private land) and back-tracking up Coley Hill before eventually spying a metal kissing gate beyond the mud. A finger post or some kind of midpoint directional arrow would’ve been of great assistance. I often wonder how locals (presumably not carrying OS maps) manage in such situations. I often see dog walkers not following the public right of way (a crime I also used to unknowingly commit, with a lead in hand). 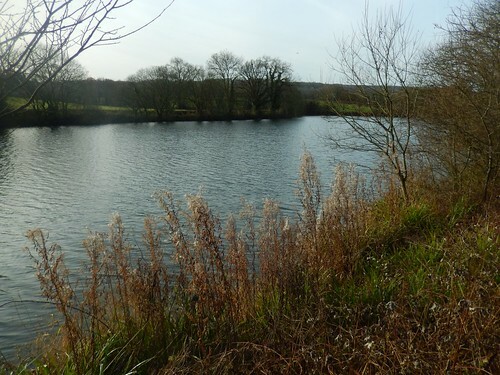 This was my second visit to these reservoirs in 2016. 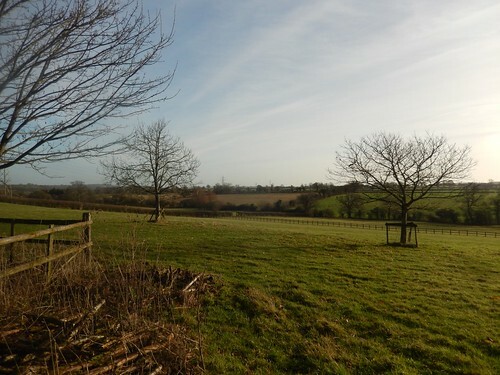 My previous walk here had begun at East Harptree woods, which is a few miles west of this location. 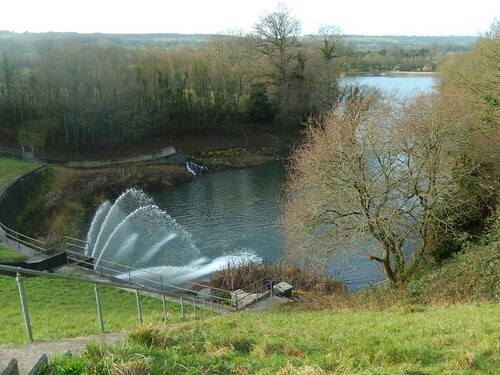 Lower Reservoir has its own water features. There’s even a small jetty but I imagine its for private boating only. 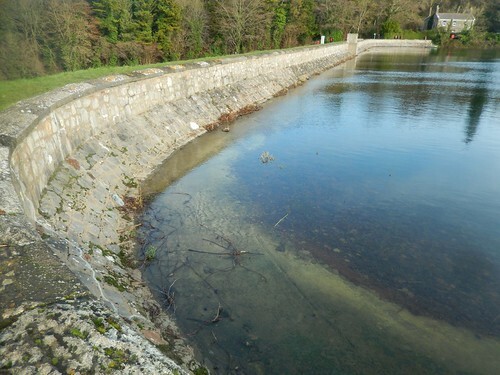 At the end of a short-but-steep climb, you can overlook Lower Reservoir from the dam that keeps Upper Reservoir at bay. 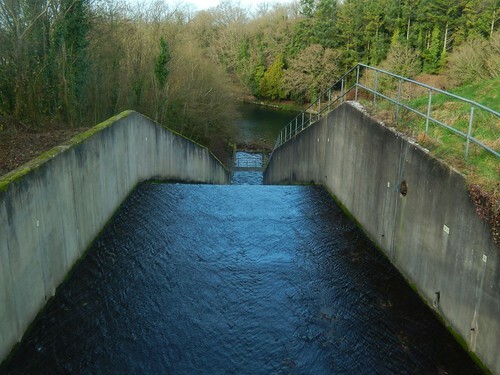 A public footpath crosses the dam but there’s nothing to physically stop you from descending steps for a closer inspection of the water. 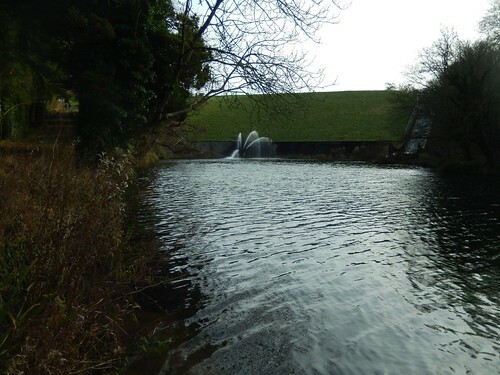 Seeing as this is a reservoir and not a water park, I wonder why it jets out in this fashion? Also, why is there a form of giant water slide? Why not have a large fall? There are signs warning you to keep out of the water at both reservoirs, due to an algae issue. There’s a narrow footpath alongside the eastern edge of Upper Reservoir and this eventually leads to a quiet road on the outskirts of Litton, where an unofficial parking space for one (maybe two) cars can be found. I’m not aware of any official or permissive spaces for car parking nearby. 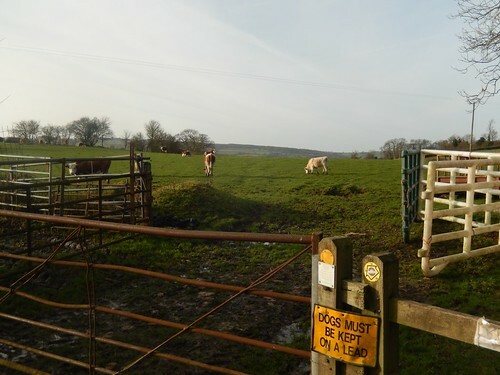 Following a short loop around Litton, I chose to ignore the guided route along Back Lane; instead, walking further along the road (which can be quite busy) to follow a series of footpaths (always preferable to tarmac) to a point along Whitehouse Lane. 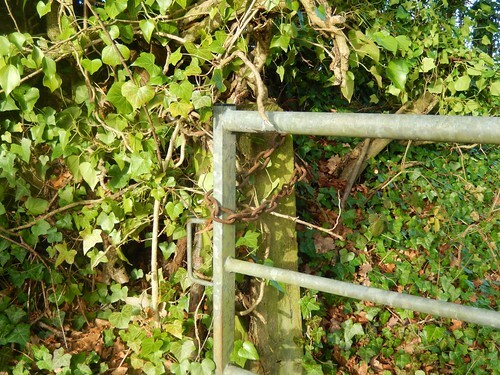 While the footpath sign was in tact, I found each of the first two gates I needed to access had been secured shut. I think I’ve already reported this to the council. It was a pain to climb over two in short succession. 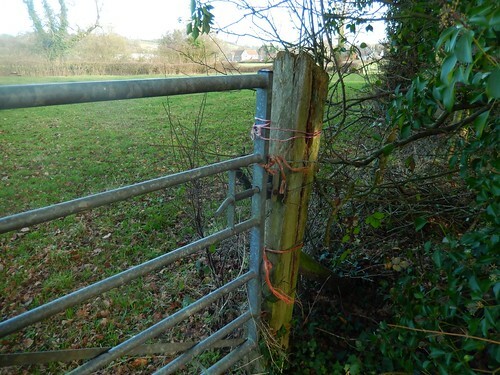 Perhaps this adds to the argument in favour of the author’s decision to follow the quiet roads instead… At the next stile, a portion of the waymark had been chipped away. Why?… How?… I find this so frequently and yet, I’m often suspicious. An elderly man (possibly in his eighties) with a walking frame greeted me as we crossed paths along Whitehouse Lane. He was cheerful with the weather and asked where I was going. 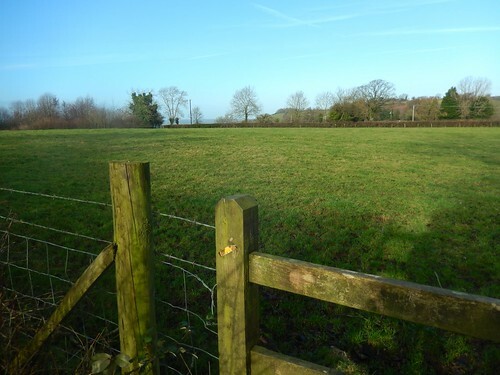 He even suggested I could walk through a gate to my right and cross a field to reach a stile for a shortcut… All of which, I knew, was private land with no public right of way… Maybe he was the landowner – if not now, perhaps some time ago. He must’ve been part of the family, at least. I felt it was good to see him getting outside, even if not as free and able as a younger person. 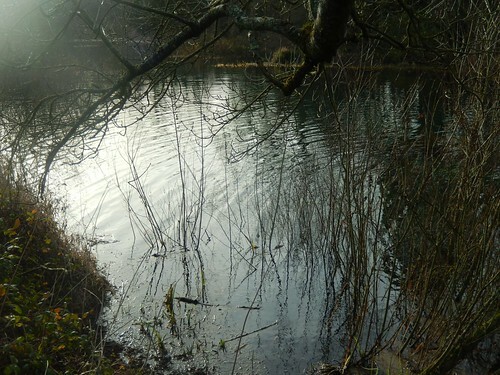 This led me to the track of Coley Manor Farm, with Lower Reservoir now on my right. 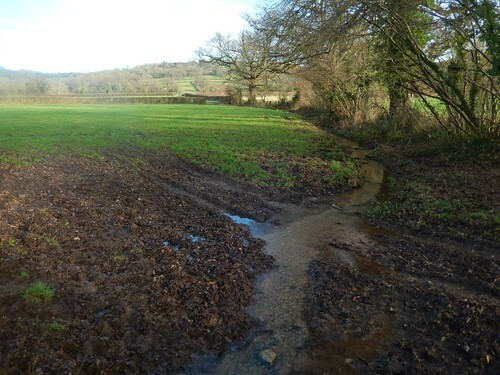 From Coley, I picked up a path alongside the River Chew and would follow this north towards Tudor Farm. 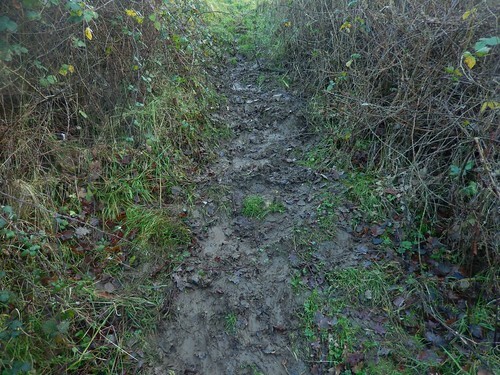 A small group of other Boxing Day walkers had decided against following this potentially-muddy path in favour of sticking to the road. I’d soon see them again, further along the tarmac. This house greeted me from afar, on the final approach to South Widcombe. 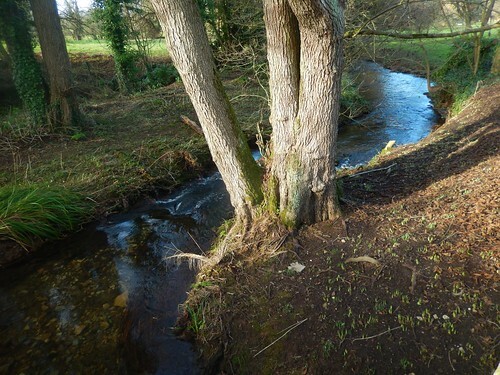 I soon picked up the Limestone Link long-distance path, heading eastwards, with the River Chew reduced to a trickle across a pair of fields. 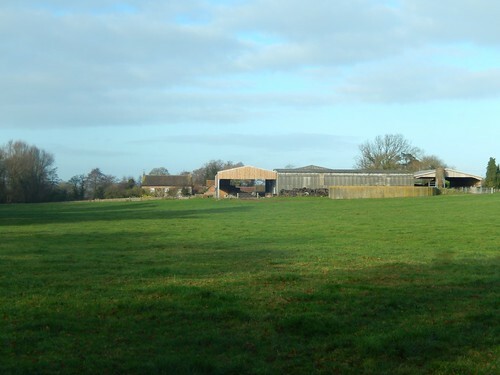 Raising my head, I could see the unavoidable ascent of my return to Hinton Blewett. 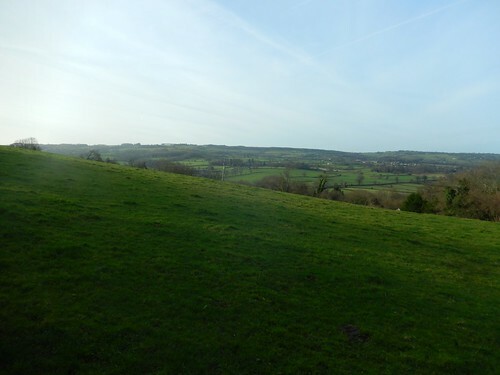 I had previously descended this hill on the walk beginning in East Harptree. It was as muddy and troublesome trying climb up it (without a walking pole) on this occasion! 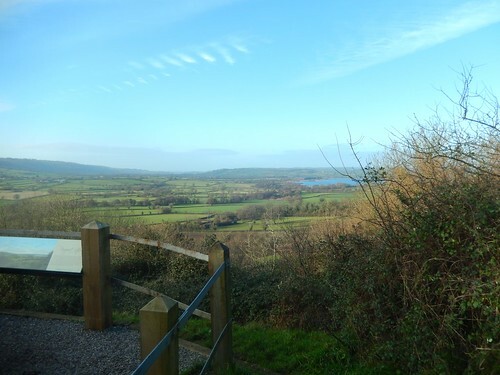 At the top, your reward is Prospect Stile and its magnificent views across the Chew Valley and beyond. 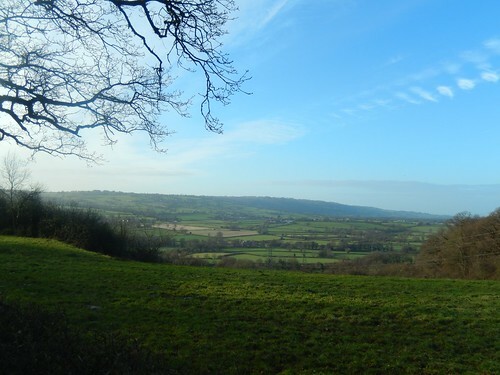 You can also see the higher ground of the Mendip Hills Area of Outstanding Natural Beauty. 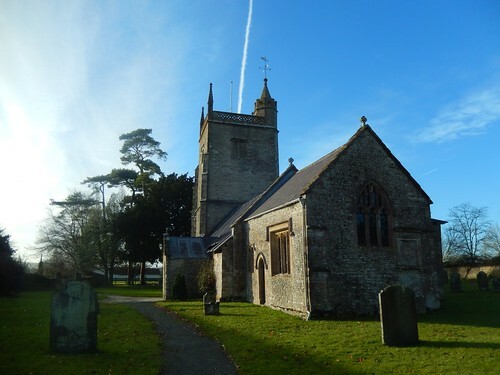 Before returning to my car, I had a brief exploration of the local churchyard. 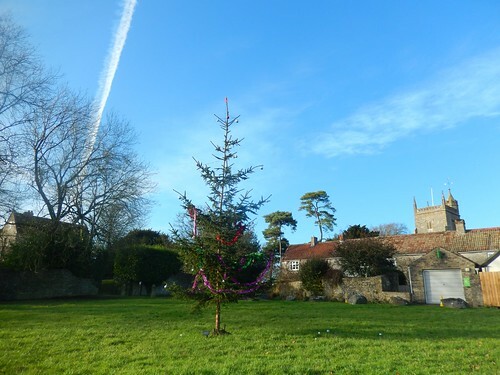 One day after and I found a miniature Christmas tree had been decorated on the village green. If you’re looking for a shorter walk, I highly recommend looking in to this. You couldn’t break the route down further, as the web page article suggests.